Rain of Space Dust - Universe Galaxies And Stars Section. Constant Rain of Space Dust Adds Up. 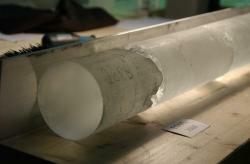 Ice core from Antarctica. 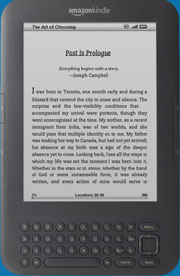 Image credit: AWI. A slow, steady rain of cosmic space dust is always falling through the Earth's atmosphere. These particles from space are infused with a rare isotope of helium that makes it immediately identifiable compared to a more common isotope of helium we find here on Earth. scientists recently drilled an ice core in Antarctica containing a record of this dust fall that goes back 30,000 years. This new data gives scientists another line of data to study global climate history as the ratio between the isotopes varies between interglacial periods. For the last 30,000 years, our planet has been hit by a constant rain of cosmic dust particles. Two scientists from the Lamont-Doherty Earth Observatory (LDEO) at Columbia University in New York and the Alfred-Wegener-Institut (AWI) for Polar and Marine Research in Bremerhaven, Germany, have reached this conclusion after investigating the amount of the helium isotope 3He in cosmic dust particles preserved in an Antarctic ice core over the last 30,000 years. They have shown that this rare helium isotope in cosmic dust exceeds that of terrestrial dust in ice by a factor of 5,000. Moreover, measurements of the amount of 4He – a helium isotope much more common on Earth – in the Antarctic ice strongly suggest a change of origins in terrestrial dust between the last ice age and the interglacial warm period we currently live in. In the current issue of Science, the scientists from New York and Bremerhaven for the first time present chronologically resolved measurements of the 3He and 4He flux of interplanetary and terrestrial dust particles preserved in the snow of the Antarctic. According to current estimates, about 40,000 tons of extraterrestrial matter hit the Earth every year. “During its journey through interplanetary space, the cosmic dust is charged with helium atoms by the solar wind. At his point they are highly enriched with the rare helium isotope 3He,” explains Dr Hubertus Fischer, head of the research program “New keys to polar climate archives” at the Alfred Wegener Institute. “Cosmic dust particles in the size of a few micrometers enter the Earth’s atmosphere unharmed and carry their helium load unchanged to the Earth’s surface where they are, among other places, preserved in the snow and ice of the polar ice caps.” Due to the high temporal resolution uniquely to be found in ice cores, it has now been possible for the first time to determine the temporal variability of this helium flux between glacial and interglacial periods along with the 3He and 4He ratios of these exotic particles. The results are expected to have significant impact on interpretation of high-resolution climate archives, such as ice, marine and lake sediment cores. This, however, is not all the helium isotope method has to offer. The ratio of 4He in terrestrial dust to the dust concentration itself reveals a marked difference between the last ice age and the current warm period. As. Gisela Winckler, head of the working group 'Isotope Tracers and Constant Flux Proxies’ at L-DEO says, “the terrestrial dust coming down on Antarctica during the ice age obviously is not the same as that during warm periods. This may be due to the mineral dust originating from different regional sources or to changes in weathering, the process responsible for production of dust.” Both scientists now want to intensify their collaboration even further and investigate the details of this phenomenon. Data for this study have been collected within the European Project for Ice Coring in Antarctica (EPICA). As the German partner within EPICA, Alfred Wegener Institute is responsible for the Dronning Maud Land drilling operations. The EPICA project is carried out by a consortium of ten European countries (Belgium, Denmark, France, Germany, UK, Italy, the Netherlands, Norway, Sweden and Switzerland). Coordinated under the roof of the European Science Foundation (ESF), EPICA is funded by the participating countries and the European Union. The manuscript “30,000 Years of cosmic dust in Antarctic Ice” will be published in Science on July 28, 2006.